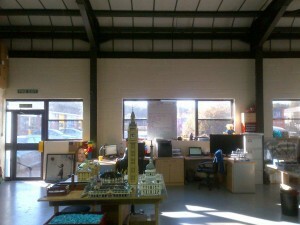 Bright Bricks, the UK’s only LEGO professional creators, required additional production and work areas for their rapid expansion. They contacted Hampshire Mezzanine Floors to provide a cost effective storage solution, recognising that in this instance a LEGO structure was not their best option. After initially discussing the client’s requirements, it became evident that the proposed mezzanine floor would also be needed for future office expansion as well. A general access 1200mm wide staircase was specified to achieve the requirements for office and storage use. The mezzanine floor also had a 1 hour fire resisting suspended ceiling and GRG white vertical fascia fitted in readiness for the future office fit out. The new mezzanine floor has given Bright Bricks much required additional floor space and enabled them to plan for new ground floor offices and reception area without losing significant work areas. The mezzanine floor was installed in 2 days and then the suspended ceiling and fascia were installed alongside the clients existing electrical contractor. The project was installed on time and on budget. Bright Bricks is fast becoming recognised globally for its capability to stimulate brands with ‘larger than life’ LEGO models. Founding Director, Duncan Titmarsh is the first LEGO Certified professional in the UK and his passion is continually driving Bright Bricks forward to the point where his business is thriving and reverberates the widespread popularity of LEGO bricks.